Almost every object on display in the Soldiers and Chiefs exhibition in Collins Barracks has the potential to extend our understanding of the many strands that form Irish Military history. One item that speaks eloquently to me is a small black leather-bound diary that rests among the exhibits relating to the First World War. A visitor could easily overlook it but in so doing would miss a link with a man who was the subject of one of the iconic images of that war. The diary belonged to Fr Frank Gleeson who served as a chaplain with the 2nd Battalion of the Royal Munster Fusiliers for most of the War. 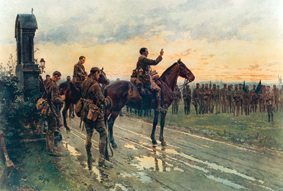 On the evening before an attack by the battalion at Rue de Bois, near Festubert, Northern France, on the 9th May 1915, Fr Gleeson, on horseback, gave a General Absolution to the soldiers in front of a roadside shrine. The painter Fortunino Matania saw the blessing and was inspired to paint a picture that was later reproduced and was hung in many Irish homes. In the failed attack, the Munsters lost their Colonel, Adjutant, 17 other officers and 374 soldiers. Born in Templemore, County Tipperary in 1884, Francis Gleeson was one of thirteen children. He was ordained in 1910 and was serving as a chaplain in a St Mary’s Home for the Blind when the war began in 1914. Having volunteered to serve, he was appointed chaplain to the 2nd Royal Munster Fusiliers in November of that year. 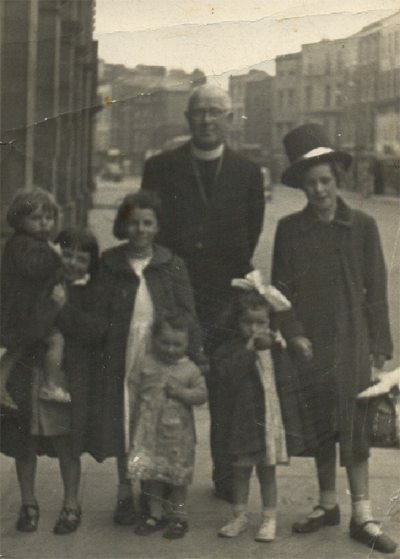 His first appointment was for a year after which he returned to serve as a curate in Our Lady of Lourdes Church, Gloucester Street, now Sean McDermott Street, Dublin. He went back to the Munsters in May 1917 and served for two more years. He recorded his experiences in the diary which is now on view. In 1921, he officiated at the dedication of the memorial crosses at Etreux which commemorate the men of his battalion who died in the heroic rearguard action that delayed the German advance in August 1914. After serving as a curate in Gloucester Street and St Michael’s Dun Laoghaire, he was appointed Command Chaplain for Dublin in the National Army on 12 February 1923. He was appointed as curate in Bray in May 1924 and was made Parish Priest in Aughrim Street in January 1941. His final 15 years were spent as the Parish Priest of St Catherine’s in Meath Street in Dublin which is only a short walk from the exhibition. He was appointed Canon in 1956. When he died in June 1959, his papers were left in the Parish Priest’s house. Many years later when the rooms were being cleared, the Dublin Diocesan Librarian was informed that there might be some important material at risk. The diary was found, preserved in the library and eventually included in the exhibition. I am glad that the diary is included in the exhibition and that Fr Gleeson services to his fellow countrymen has not been forgotten.